There are enough autopsy and post-mortem posts going around the BC blogosphere, so no need to pile on in that department. Plus, ATL is firing off on Spaz/GDF as is required, BCI is covering most of the sarcasm and criticism of party line journalists and Soaring to Glory has the stat-based critiqued covered just fine. Why ruin their fun? We need something to call our own, so we're going to start looking ahead to the next time the team plays football - fall 2012 </pours one out for the bowl streak>. Now, we don't know the schedule, but we think there is enough evidence floating around for us to make some educated guesses at how the slate could flesh out. First, let's talk about what we know. BC will play 12 games in the 13 weeks between September 1 and November 24, 2012. There will be seven home games next season - four in conference plus three visiting schools - plus four more ACC games and an away OOC with Northwestern. Dates are set for the game in Evanston against Northwestern (9/15) as well as the home matches with Army (10/6) and Notre Dame (11/10). Filling out our grid, let's start with these absolutes. Now we need to start making some assumptions based on history. There is one trend over the last few years that I expect to change based on the fact that BC will be doing every trick in the book it can to sell tickets (attendance numbers were one sticking point this year when it comes to talking dollars and cents). One way to guarantee tickets and gameday revenue the year after a disappointing season? Make the Parents Weekend game one that won't push tickets normally - like the FCS matchup with Maine*. Light pencil on that one, but that covers all of the out of conference games. *Please note, there is some dispute over the FCS opponent. BCEaglesFootball.com and a few other sources list Maine, while BCEagles.com lists URI. I doubt the latter since it also lists Northeastern for 2013, years after its football program ceased to exist. Now we need to start cracking the shell of the ACC schedule makers in order to fill the rest of this bad boy out. At least one thing that we can probably predict: the three times that BC has played Miami when both have been members of the ACC, it has always been the weekend of Thanksgiving. BC likely won't resist: the traditional match-up will play well over the holiday in terms of selling tickets. Let's put that in as well, and then take a look at the rest of November games. This scheduling will give BC four of seven home games scheduled, but two of them in the last month of the season. While this November has certainly been unseasonably warm, it isn't likely that the ACC will bank on that as it thinks on when to schedule times for Clemson, Maryland and Virginia Tech to come north. 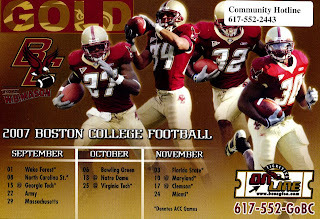 After all, since joining the ACC, BC has only had more than two home games in November once, and that was 2008 when Clemson showed up on November 1 and there were five Saturdays in the month. That means that those other two November dates would be road ACC contests against one of Florida State, Georgia Tech, NC State or Wake Forest. We'll hold the "Or"s there for a bit. We need to take care of a few other things. First things first, if this goes as predicted, it means that BC will start with a conference game for the first time since 2007 when it faced Wake Forest during Matt Ryan's senior year. BC has rarely started on the road - Labor Day in Boston is usually quite nice weather wise and a safe gamble - so, we look at the set schedules for Maryland, Clemson and Virginia Tech. Clemson is locked into the Chick-Fil-A kickoff in Atlanta on 9/1, playing Auburn, so they're out and will be coming to Boston later in the fall. Virginia Tech has a really full September as it is, but no FCS game set (is James Madison available) and two established away games in the month. With those factors, it'd be unlikely for the Hokies to come north to start the season, leaving us an opening weekend tilt with the Terps to throw in. The next scheduling problem I see is the potential run in of three straight home games, so let's get the bye week, Clemson and Virginia Tech in there to take care of that issue. One data point: in three of the last four seasons, BC has taken the week off right before facing VT. If that trend holds, only 10/20 and 10/27 work as dates to schedule the Hokies. That also helps us fill in the rest of our dates based on consecutive home games in September to look as follows. How do we predict the shakedown of the away games? Let's first look at the trip to Atlanta, which will potentially be the last away game with the Yellow Jackets for the next six years with new teams coming into the ACC. Considering GT will end their season with SEC rival Georgia, it would be surprising for them to play a non-Coastal (and likely less competitive) opponent in the month of November, and since the only two times BC has played GT as members of the ACC it has been in the first weeks of the season, we award that September game to GT. Useless exercise? Sure. We won't know until the last week of February or so how horrifically wrong I am with this prediction. At least it was fun to play out, and that late schedule coming out of the bye looks like a beast.